This paper introduces the Italian translation of a brief text written by French philosopher Julien Freund, La talassopolitique. The text has been published in 1985 as an afterword to the French edition of Land und Meer (1942) by German philosopher Carl Schmitt. In the first part, I briefly introduce Freund’s theory of the presuppositions of the politics. In the second part, I analyse the key arguments of Freund’s essay, with a special focus on the relationship between space and politics regarding the oceanic spaces. In the last part, I suggest a new line of research focused on the relationship between politics and air space, namely a political philosophy of the sky. Julien Freund’s essay has been published in 1985 as an afterword to the French translation of Carl Schmitt’s Land und Meer. Here, we provide its Italian translation. In general, the notion of thalassopolitics means the relationship between oceanic spaces and politics. In Land und Meer, Schmitt describes the history of the world as the history of the conflict between land and sea. In his afterword, Freund develops Schmitt’s idea by focusing on the nexus between politics and oceans. In the first part, he criticizes the geocentric approach in political studies; in the second part, he analyses the relationship between technology and oceanic space; in the third part, he analyses changings in military strategies due to the growing relevance of oceanic space; in the last part, he sketches the new role of Europe in the new global context. In the political system of the German Federal Republic the term Volksparteien is used to indicate the two main parties, i.e. the Cdu/Csu and the Spd. In the past, these two parties obtained about 90% of consensus in the federal elections. In the last years, this percentage has fallen down (53% in 2017). Party membership is declining too. Many reasons explain this crisis, above all the end of the territorial political subcultures. If the Volksparteien will survive in future is an open question. The article analyses the impact of European integration on the German party system, from the outbreak of 2010 European sovereign debt crisis to the 2017 federal elections. It argues that the most recent and most relevant political developments in German politics are closely linked to the increasing salience of European integration. The chapter contributes to recent scholarship questioning whether European integration may become a new cleavage in the German party system. On March 14, Angela Merkel swore as German Chancellor for the fourth time in a row. Given that Grand Coalitions are no longer an exception in Germany, other elements in the September 2017 federal elections may represent a discontinuity with the past. The first is the remarkable electoral success obtained by AfD, which is now the third German party; the second is the unusually long time needed for the government formation and the high level of incertitude that accompanied this process. The article investigates the rationale of the German stance towards the European crisis in light of the (corporatist-etatist, neo-mercantilist) German socio-economic model and the widespread concern about losing the competitiveness that Germany regained through painful reforms and changes. We conclude by discussing the internal and external tensions conditioning the current evolution of Germany’s economic and European policies. The EU is becoming much more differentiated than in the past. Even if differentiated integration is not a new dynamic, only recently it entered into the highest political agenda. As a consequence, differentiated integration poses new challenges to the Member States, particularly those that never actively participated to this debate. Among them, Italy who needs a clearer definition of its interest in a new context. The aim of this article is to make a first assessment after Macron’s fist year spent as President of France. First of all the new young French President has shown the intention of using all the institutional possibilities that French Fifth Republic gives to the President and he built a real “executive democracy”, centered on the Elysée Palace and on the first inner circle of the President. Secondly he showed a huge voluntarism and started a lot of important reforms on the fields of job market, education, transport sector, and so on. Finally he’s trying to reform France in the attempt to have the possibility to negotiate from a strong position a real reform of the European Union, to reduce German dominance. This will be his most difficult challenge. But on this field he’s probably going to stake all his opportunities to be reelected in 2022. Frédéric Turpin, Multilateralism and european integration: the two pillars of a France restored by President Emmanuel Macron? Multilateralism and European construction are at the heart of President Emmanuel Macron’s international approach. These two questions are illustrative of the idea we have of his power. Multilateralism is indicative of the relations that a state wants – or can – maintain with others. The choice to pursue a foreign policy in more bilateral or multilateral terms reflects different conceptions of its power and its integration into the international system. European construction is also illustrative of this notion of power. And, like multilateralism, it is as much about the project of power as the practical necessity, of a conceptual adherence to a form of interstate relations or even to its overtaking. Analyzing the first steps multilateralist and those of the European policy of President Macron makes it possible to question the multilateralist turn of French diplomacy, initiated since the 1970s, and then to study how the European policy of France integrates even became one of the fundamental drivers. During the 1960s, because of its good economic results, France had the dream of reducing the inequality of its economic weight relative to Germany. But, since 1974, this trend was reversed. Industrial production of France, which represented more than a half of that of Germany at the end of the presidency of Georges Pompidou, represents today just over one third. The lackluster economic performance of France since 1974 can be explained by the time lost in adapting to the liberalization of international trade. This article analyzes how the Italian press has looked at Emmanuel Macron’s first year at the Elysée Palace. 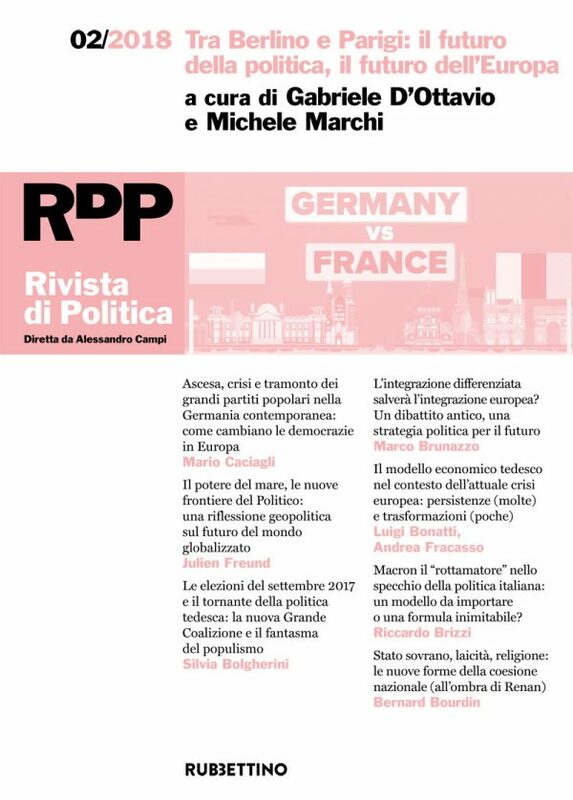 Riccardo Brizzi underlines four phases: the underestimation of En Marche! and Emmanuel Macron at the beginning of the presidential campaign; the crescendo of interest and the “Macron-mania” that accompanied the election and entry to the Elysée; the disappointment following the french unilateralism on the migrant emergency, the Libyan crisis and the nationalization of the Saint-Nazaire shipyards; the progressive normalization of relations under the Gentiloni government. In France after 1516 Bologna’s Concordat the national identity has always been linked to the State sovereignty, royalist and then republican (after the French revolution). You can’t understand the 1905 French Law on Separation of the Churches and the State if you don’t consider that. If you want to describe that in another way, you can say that different regime changes are dominated by continuity. This State centered culture is going to live a deep crisis, and the 1905 French Law too. In this situation the Catholic Church could help to build a new national identity. The problem is to define what nation is. In this sense reconsidering Renan’s works could be an important starting point.